If you are interested trading silver then there are few suitable silver stocks in Australia. Macmin is one candidate, but the lack of resource upside makes them a poor candidate. Others tend to be explorers with alot of work to do. It makes more sense to look at US or Canadian stocks. Alternatively you can invest in silver through a CFD trading platform such as www.cmc-markets.com. As we speak gold has fallen to $850/oz and silver has fallen with it back to $16.00/oz. This is not a support level, and since the US market has yet to close, I would not be surprised to see further weakness and a close either today or tomorrow around $15.50/oz. 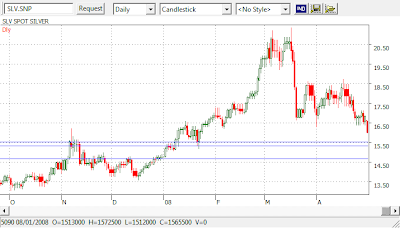 This is a strong support, and I dont see silver falling back to the $14.70 level. I expect silver prices to recover quickly, so $15.50 is a good entry level.